Where does it state this? 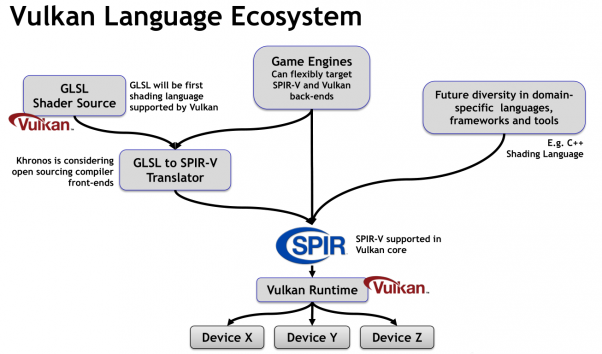 just to chime in, Vulkan is similar to DX12. I know more about Dx12, but the general consensus is that it takes a lot of time to make it run as fast as DirectX11 and it's not beginner friendly. The Api exposes a lot less stuff, which can be good, but it also means that even stuff like Mipmapping has to be implemented by hand. Great for experienced devs, but I'm not sure if Monogame is the right target group. actually directx11 can realize all things that dx12 does, too. MS even updated dx11 to 11.3 after 12 came out. About the SpriteBatch implementation, the transformations (except for the default SpriteBatch matrix and optionally a matrix you passed to SpriteBatch.Begin) happen on CPU. You can see that here: https://github.com/MonoGame/MonoGame/blob/develop/MonoGame.Framework/Graphics/SpriteBatchItem.cs#L26. All Draw calls internally use one of the Set methods in SpriteBatchItem. I meant the Vulkan tools are the best way forward to get cross-platform shader compilation. And once we have that set up we can look at implementing compute/geometry/other cool stuff. Hey jjag how does spriteBatch actually batch up separate groups of different textures into calls, Im not getting how the batcher chunks up its draws. I see this but i don't get how it works with compare to in order to actually break up drawIndexedPrimitives when items with different textures are to actually be rendered? // set SortKey based on SpriteSortMode. // Comparison of Texture objects. Or am i totally looking at the idea behind it wrong. Ah i kinda see ill have to check it out later on. @willmotil that looks good, are you using an effect for the colour fading? random colours too? that looks good, are you using an effect for the colour fading? random colours too? 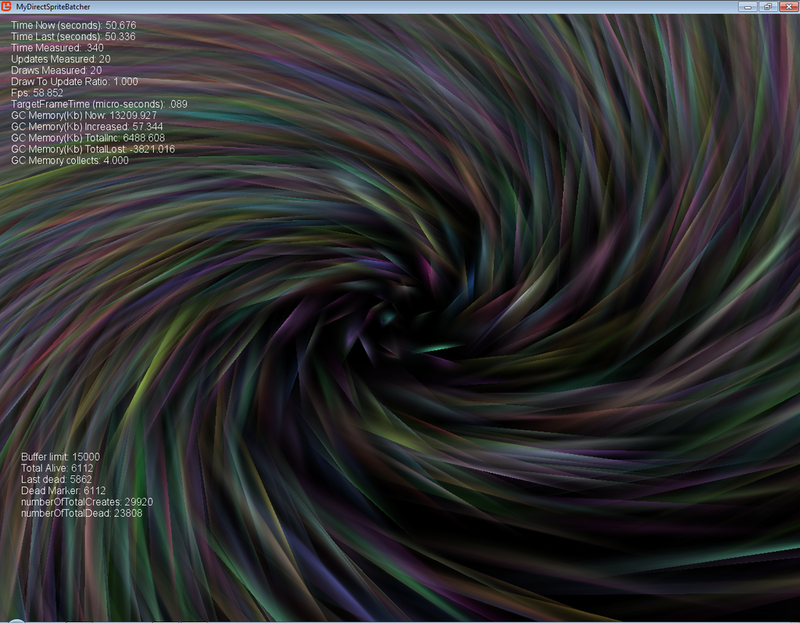 Nop Just straight alpha blending scaling and rotating. The image itself has some transparency in it and the colors im passing sometimes have its alpha set lower. This is a updated version of the earlier code. The shader is the same empty one used before to bypass spritebatch altogether. The method AddSpriteToBatch(...) is basically a spriteBatch.Draw(...) call. It does it all without any matrices either. Just straight linear math, translations, rotations and projection. 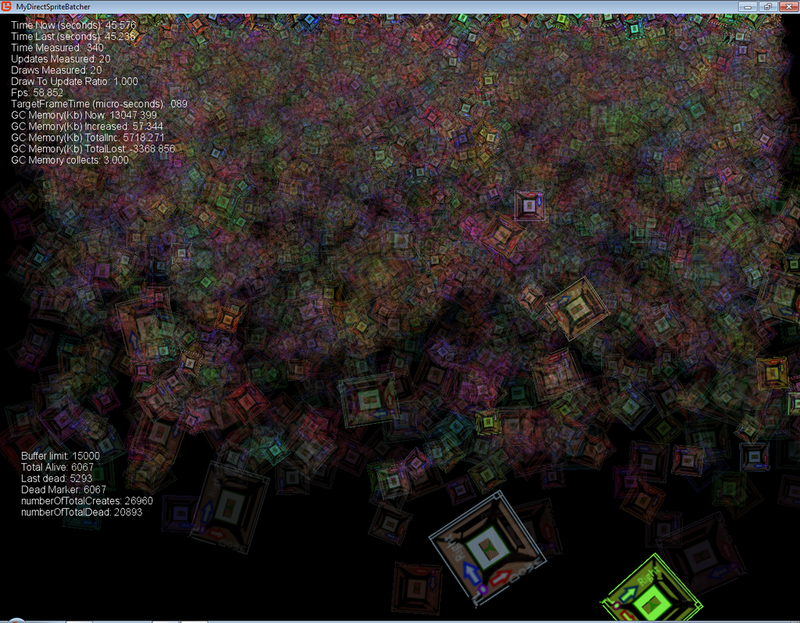 It bypasses everything and does it directly, but it only works on a single texture per buffer at least right now. // The 2x coefficent which is a mulitpiplier to put the rectangle in the 0 to 2 range. // With respect to the size of the window width and height. // Determine the vertice origin for rotation and scaling which i will do in place instead. // If we really want to just scale from top left to bottom right. // If rotation is specified we will perform that now! // Rotates the vertices from the origin here we make it the center as opposed to how spritebatch does it. // We could pass a offset here to further translate the origin like spritebatch. // However it is no longer necessary, this way we can pre transform the position of the rectangle itself. // create the indexs im not sure this parts not simply redundant. The image itself is solid alpha at the center and fades as it goes outwards. Its in pure white, to work with any color i pass to the method as a parameter. Check this out exact same lone image as before drawn a ton of times moving. Same as above but with variably dependent decreasing alpha in the color. That is passed to the method. It actually looks much cooler when you see it. Because all the soft colors are flashing like soft lightning in the background. 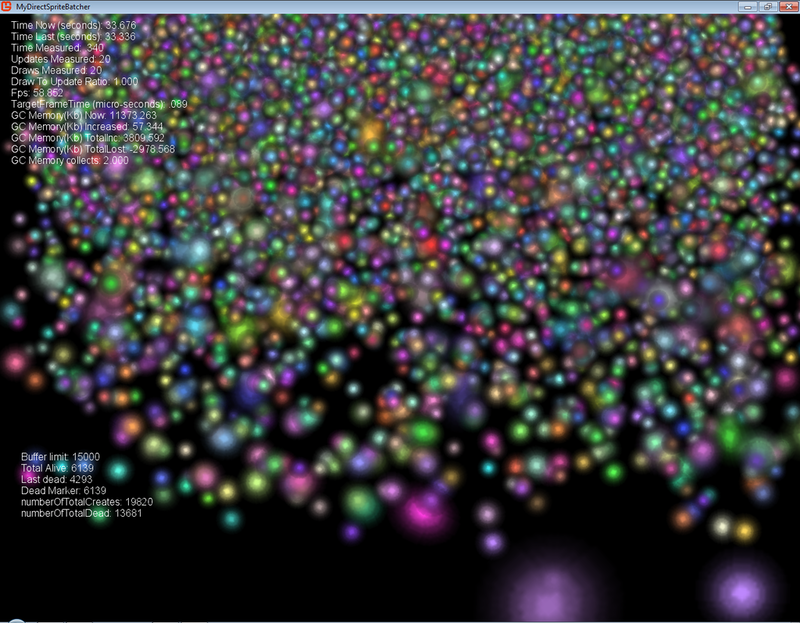 The class that moves the particles is just a footnote to the actual functional methods and classes. For instance the particles are in a non sorted buffer that basically only moves things on death or creation of a particle. It only really moves the pointer most of the time so no huge re-sort ever occurs but that is more of my own pattern then a class. The class itself is full of junk to make the particles behave like in the picture but... the buffer pattern it uses is the cool part. // technically this is pointless in most cases it can just grow forever. // it still will function optimally, its always gonna sort O(n) or below. // This is basically the entire sort it is simple. Why is it blurry? because of movement or? Hey, do any of you dabble in electronics? No i have a bad habit of shocking myself. Oh its blured due to stretching in one direction the width. 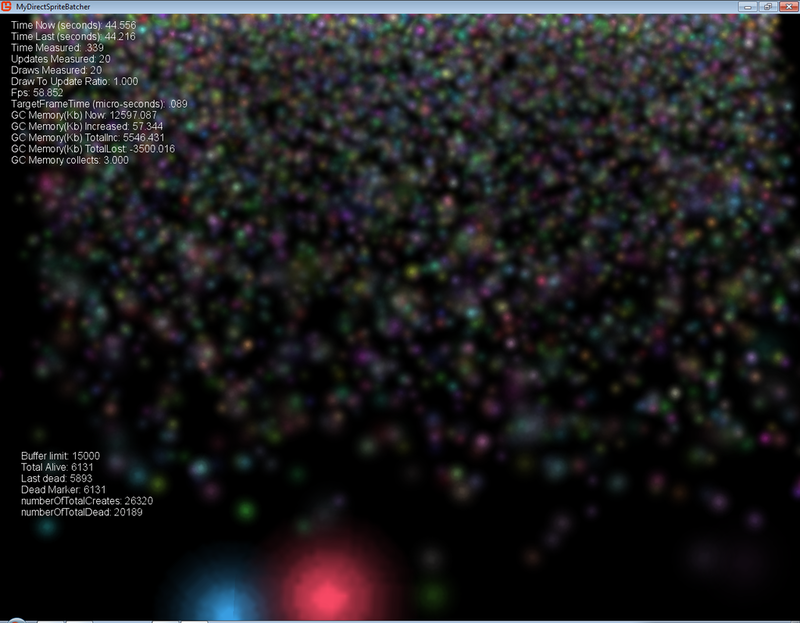 As well as how many there are that have super low alpha nearly invisible, when they overlap it looks like blur. All the streaching and fading occurs at the top 10% and above offscreen. Particularly the slow moving particles get walloped as they stay in that part longer it makes them oblong and they get rotated too. So the edges aren't black and they all blend with each other well. 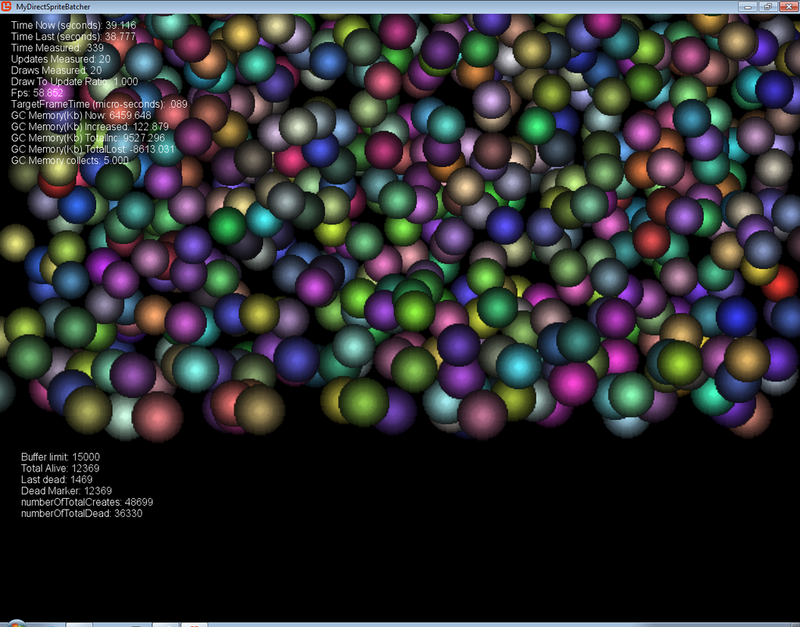 That previous solid ball look was a artificial effect of not turning stuff off.. The bottom most images are basically the fastest longest living so they they didn't get butchered much till they die. They are all just a transparent white image colored like the bottom red image that's blowing up. here's what it looks like with a square image. Hows this for a bug in my secondary test method i messed up the math the rotational origin got screwed up and i got this bug with the same code lol. Hence forth i will call this bug the wormhole effect bug.